For the more unkempt styles with medium hold to provide touchable texture. Cedarwood Fragrance. Vegan Friendly & Cruelty Free. 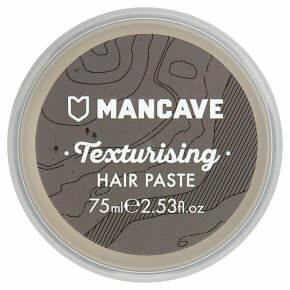 Not tested on animals.The ManCave Texturising Hair Paste is developed with medium hold to provide texturised touchable styles whilst naturally infusing it with nutrients. Fragranced with the premium signature 'Cedarwood' scent makes for the ultimate styling product. This product does not contain; parabens, sulphates (SLS SLES), synthetic dye, petrolatum, mineral oils, ingredients from animal sources and is not tested on animals. Directions: Apply to towel-dried hair, then style as desired. Avoid contact with eyes. For external use only.